Are you putting content out there, but feel like nobody is paying you any attention? Once you have someone’s attention do you find it hard to maintain it? Do you feel like people don’t listen to you? Don’t respect you? Do you have trouble getting people to do what you want them to? Perhaps you’re missing one or more of the seven systems of influence. 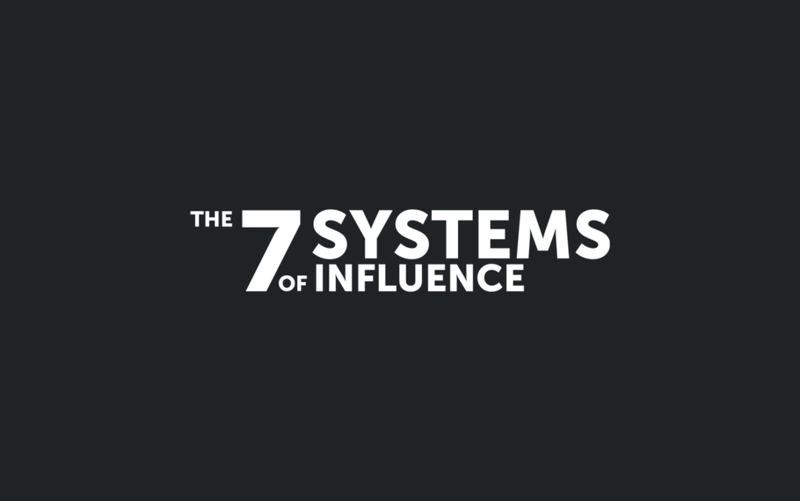 The 7 Systems of Influence is the title of my next book. I’m working on it right now, and you can see exactly where I’m at because I’m working on it publicly on Medium. Why did I choose “The 7 Systems of Influence” for the title of my book instead of “7 Habits…?” You mean, aside from the risk of a lawsuit? Trust me, avoiding copyright and trademark issues was definitely on my mind, but as I began fleshing out the idea of the book I realized “habits” aren’t what highly influential people build their success on. Gandhi wasn’t Gandhi because he had a vision habit, a speaking habit, or a habit of connecting with the right people, but he most definitely had a system that helped him create and maintain a vision, a system to produce compelling speeches, and a system for gaining an audience. While I’m certainly interested in the habits of highly influential people, especially those that support their influence, I felt like their success in the realm of influence was more likely to be found if I looked at the systems they created and used. Seven might be a nice sounding number, but it also happened to fit. I tried out 5, 6, 10, and 12 as well, just to make sure I wasn’t using 7 for other reasons, but anything less than 7 left something out, and every other system I could think of beyond those 7 seemed to fit under one of the systems I already had written down. The systems highly influential people use I’ve labeled as vision, action, positioning, audience, knowledge, content, and productivity. Is every system required in order to be a person of influence? No, not at all. And being tall isn’t required to make it into the NBA, but it sure doesn’t hurt. Here’s a brief overview of the systems. What’s your dream, your goal, your objective? What do you want to accomplish with your influence? Thomas Jefferson wanted liberty. Gandhi wanted peace. Gary Vaynerchuk wants to buy the Jets. What about you? Without a Vision System you’re flying blind, sailing without a rudder, exploring without a compass, lost in Hong Kong without GPS (it’s fun, but time consuming). This system helps you figure out what you want in terms of the big picture, but also in the details, which are constantly changing. It’s your imagination, your creative self, and if you can harness a system to keep it on target you might get where you want to go. No action, no influence. Act, or be acted upon. Proactive vs. reactive. Intent to act is not enough. Influential people have an Action System that facilitates or provokes them to repeatedly take the big leap and do something. Know thyself to define your personal brand. If you don’t know who you are, what makes you special, and what your genius zone is, then you will merely add to the noise rather than occupy your unique place in the universe. Your Positioning System helps you identify your expert zones, then your genius zone, and build a personal brand tagline. Then it helps you know when to change it, when to refine it, and when to change it up entirely. Your Audience System helps you identify who you should be talking to, the message that will move them to action, and what channel to use to deliver that message for maximum effect. Learn more to impact more. You see it all the time–people talking about something they know little about. They may be able to fool those who know even less than they do, but those who are true experts can see right through them. A little knowledge can make you influential. More knowledge can make you more influential. Put a Knowledge System in place to help you learn more, so you can give more. Without this, you ain’t no influencer. If there is any one system of influence where it all comes together, it’s your Content System. Everything you do is content. Your words are content. Your actions are content. Your example is content. You are constantly producing content, but is it influencing your audience in ways that match what you’ve created with your Vision System? Is your content purposeful, intentional, or are you stuck on default? The more productive you are, the more opportunity you have to serve others with your influence. If you are restricted from producing as much purposeful content as you could, your influence is limited, and the world is poorer for it. Your Productivity System helps you influence more, faster. Not that influence is directly tied to putting out lots of content. It’s not about being super busy, it’s not about producing huge volume for the sake of volume, it’s about impact. Just look at To Kill a Mockingbird author Harper Lee’s success with just one book . What systems are you consciously using? Which have you been unconsciously using? Which system do you feel you could fine tune to achieve the greatest impact with your influence?